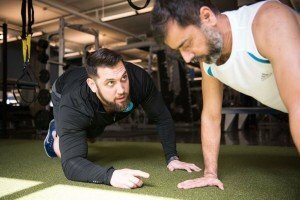 Whether you’re working toward a goal, training around limitations, or just wanting to make the most out of each minute at the gym, a personal trainer can be a wise investment. At Flow Fitness, we believe that personal training is one of the best ways to unlock your fitness potential, and we make two types of personal training available to our clients. Work one-on-one with a professional trainer, who will develop an individualized workout for you, making adjustments along the way so you won’t plateau or get bored. It’s a great way to invest in yourself, and achieve a level of fitness you may have trouble reaching on your own. Get affordable access to high-level training in a motivating team environment. We offer four training modules (Performance, Endurance, Stability/TRX, and Strength) using a variety of equipment, exercises, and training intensities which constantly challenge your body. Clients train 4 to 6 times per week under each module, which maximizes improvements in health, performance, body composition, and general well-being. Session size is small, individual attention is high, and the focus is always on you. **if you are new to TRX please arrive 15 minutes early to class.